Atlas Wire is a leading producer of Machine Tool Wire (most commonly referred to as MTW). Machine Tool Wire (ZKHZ) is a stranded flexible hook up wire. MTW is used for internal wiring of appliances which include Air Conditioners, Automatic Washers and Refrigeration Equipment, Control Cabinets, as well as other building applications. Machine Tool Wires utilize stranded copper conductors. Atlas Wire offers many flexible conductor choices including ASTM Class K standing and ASTM Class M stranding in both bare and tinned copper constructions. Our wire meets or exceeds standards of the National Electric Code and the UL 1063 Standard for Machine Tool Wires. Atlas Wire can supply Machine Tool Wire with a PVC insulation offering Moisture and Oil Resistance while meeting the VW-1 Flame Test, or with a Nylon jacketed PVC insulation offering Moisture, Oil, and Gasoline Resistance. Atlas Wire can offer Machine Tool Wire that meets many requirements, including multiple AWM styles, and a Boat Cable (BDFX) rating. 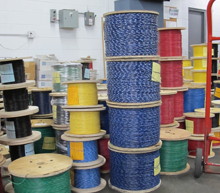 Call our sales staff to see how wires carrying multiple ratings can help reduce the part numbers in your inventory. When you are looking for Machine Tool Wire, you need to look no further than Atlas Wire. Get in touch with us at our Illinois Office at (847) 678-1210 or our Arizona Office at (520) 747-4500 or Send Us a Message to discover how we can serve you with Machine Tool Wire.